It is very possible for you to get your google adsense payment directly into your Nigerian bank account. Yes! You heard me right and very well. 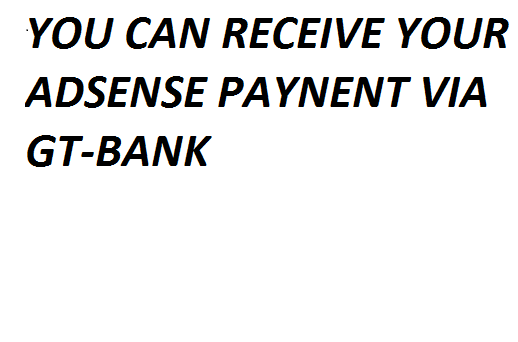 You don’t really need a domiciliary account to receive your adsense payments. Though, it will be nice if you can afford to get one. But how many of us have the requirement Nigerian banks demand before opening a current account (domiciliary) for you. Before we go on, let me tell you what you need to be eligible for a domiciliary account. ~ A 100 dollar or its equivalent in naira. ~Two current account holders who are ready to be your referees in the bank you desire to open the domiciliary account with. ~ Means of ID, it may be a driver’s licence, voter ID, National Identity card or your international passport. Guys, let’s be sincere, how many of us have these requirements? Well, as for me I have some but not all. Lol! At least I try. Now back to business, I really had a tough time trying to receive payments online until I decided to try my fate with GT-bank savings account. 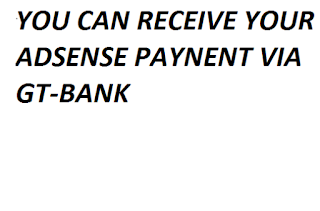 Note: I only tried this for GT-bank savings account and I can assure you it worked and I have heard testimonies. Now this is what you have to do if you are a GT-bank account holder. Navigate through to your google adsense profile or dashboard and select the gear icon and thereafter you go to the payments option. Now click on how you will get paid and then click on new payment method. Now you have to pick Bank transfer through bank account, a form will avail itself and you should fill accordingly without any errors. You will be asked for swift code, bank address, and other details. After you fill the form click on the save button. This is all you need to do. But please ensure you fill in your details correctly. If you are sure of this! Then sit back and relax till its pay day. Like I said before, there are testimonies from fellow bloggers who have tried various bank wire transfer and it worked, you too can try the adventure and relate your feedback via the comments box and I will be glad to hear from you. Another thing you should take note of is the current naira to dollar exchange rate. Believe me when I say blogging is very sweet when you are earning from your hard work online. Also, some bloggers have complained of their accounts being hacked, if you are a victim worry no more. But I must warn you to stop giving your adsense login details or blogger details to anyone. Some will offer to help you fix some issues on your blog but their main intention is to steal your account. These guys are very smart as they will just delete you as an admin and replace the payee profile information on the account. Well, if you find out your account has been hacked, don’t worry too much, this is what you should do. You just have to report it to Google by going ahead to fill the account login issues form. The form will demand you fill in your details and other relevant adsense details. If Google successfully verifies the authenticity of your claims, your account will be restored back to you. Hope this helps and do well to keep your account safe and secured.